The desire to help the people who are partially-sighted was part of what the growth of beacon tech. Long before the commercial applications of beacons created the proximity industry, it was clear that the technology could be a tool for those who needed a little help navigating their way around public spaces. #Beacons enable the blind to explore, shop, and enjoy their time in Wellington independently. Some 200,000 New Zealanders have some form of visual impairment and the Wellington deployment was designed to make shopping, getting around and enjoying all that the area has to offer easier than ever. Users can install a free application from BlindSquare in their iPhones and instantly take advantage of the navigation and information services available. After many successful deployments elsewhere around the world, this was the another use of BlindSquare’s navigational assistance capabilities in New Zealand. The application uses text-to-speech to give users audible information about their environments and even the interior layout of buildings. It gives spoken contextual direction-specific information about the names of shops and what they offer, nearby public transport stops and even the names of streets they are walking along or crossing. The idea was to build on the accessibility that beacons provided in retail, hotels and museums and take it to the next level by having everything interconnected with things like information about public transport. The project specifically set out to prove the value of a single beacon, in a single shop, illuminating the interior with information. The Wellington, BlindSquare Enabled Project was intended to offer rich information, inside and outside. In fact, a big part of the appeal for many in the partially sighted community was the ability to navigate indoors. Participation in the project was free for retailers and businesses were urged to take part. One beacon per location was installed for locations that joined with a couple of exceptions for buildings with multiple entrances. When anyone using the app passes by a beacon in one of the “BlindSquare-enabled” shops, services, offices or institutions, its name and a brief description can be heard along with information about the interior location of things like doors, stairs, and other features. This spoken information can be easily updated as needed. Here’s what you need to know about the latest beacon use case. Google Nearby notifications can send URLs to passers-by without the need for an app. Here’s what you need to know about the latest beacon use case. Google Nearby has been growing in popularity in recent months. Ordinary businesses are learning about the opportunity to reach a new customer base and solution providers are seeing a brilliant opportunity to add value to their apps and platforms. However, with great popularity comes numerous questions. What is Google Nearby, how do Nearby notifications work, and how can you use it? Google Nearby in Android allows users to discover nearby devices or contextual information without an app. There are three types of these interactions: nearby messages, communication, and notifications. Messages supports small binary (unencrypted) payloads to be shared between Android and iOS devices. Notifications send location-specific notifications to users, no app install required. These come in the form of secure URLs. These Nearby Notifications are (now famously) linked to Bluetooth beacons. The good news is they’re easy to use and don’t require much in-depth knowledge. There are several reasons to use Google Nearby. How about a Google Nearby Example? When Nearby first emerged, it was a big deal. Even now, it continues to make waves. Just recently, Google opened up their Connections API to developers. While it was previously only available to partners, now any and all happy Android developers can give it a go. Specifically, there are two key ways you can use Nearby. Trigger an app Intent. An Intent would be the description of an operation that is to be performed. For example, an action within an already installed app: open this option or file this data. When your user receives the app Intent via URL, the app will automatically run those parameters. If the app isn’t installed, it can direct users to the Play Store to download the app (or any other page). What better way to get people to notice your proximity-based app than a proximity-based notification? Google Nearby is incredibly special because it is present on all modern Android devices. If you’re running any recent version of Android, you can see Nearby notifications. More importantly, your possible visitors or users can, too. This works through Google Play Services, which is a crucial (though often forgotten) beast that basically makes your phone work as expected. Locations APIs, Google Maps APIs, and several other things run through Google Play Services. It keeps your apps updated and, now, it’s letting Google support more possibilities on your phone. *While you may be able to see how many people access the link, you won’t be able to make any connection between the phone or user and a specific click. How does Google Nearby scanning actually work? The scanning process is actually very simple and very similar to work your phone does every day. Once the phone screen is on for a few seconds, Google Play Services will quickly scan for nearby material. This does mean that if the screen hasn’t been active for a while, it won’t discover beacons and content. This makes sense for users who are passing through. A user engaged on their phone is likely to also be engaged with or staying in a location for a period of time. A user who is not engaged with their phone at all is likely simply passing through the space and has little use for the proximity-based messages. Are you a business owner looking to buy a couple beacons? Or a solution provider looking to integrate Nearby into your app? There are two ways to use Nearby, and both of them are valuable in their own way. First, you can simply use Google’s Dashboard. Once you set up your beacons, you can begin sending URLs to users, update and engage them. This option is great because it’s simple and you can do everything yourself—no need to pay for an app or provider. Plus, it’s also perfect for testing and playing around. Find the Dashboard over here and our complete instructions over here. Second, you can use a specially made app. There are several of these floating around, and they offer a wide variety of capabilities. In general, they make the services available through Google Dashboard easier to maneuver. However, they can also combine the basic Nearby notifications with other tools—beacon push notifications, data analytics, sophisticated dashboards. This all depends on the solution provider, of course. Unfortunately, if you’re looking to integrate the Google Nearby API into an app or pair it with iBeacon and so on, you’ll have to be comfortable enough to design a complete app and/or platform. Want to check the Nearby settings on your phone? What about enable Physical Web on Chrome? Check out our instructions here. I’m a business owner, and I want to reach possible customers! Awesome! In the past, you would’ve been limited to physical advertising like in-store signs or billboards. Now, you have far more options. Whether you’re a large retailer or a mom-and-pop shop, Nearby is easy to use, implement, and benefit from. However, there are a few things to keep in mind. Most importantly, you’ll need to carefully consider your target audience. If you can send messages, so can a lot of people. This is why notifications that are not well received by users (for example, perceived as spammy and therefore perform poorly) may not be shown. If you want to generate value from a Nearby campaign, you must put the user first. 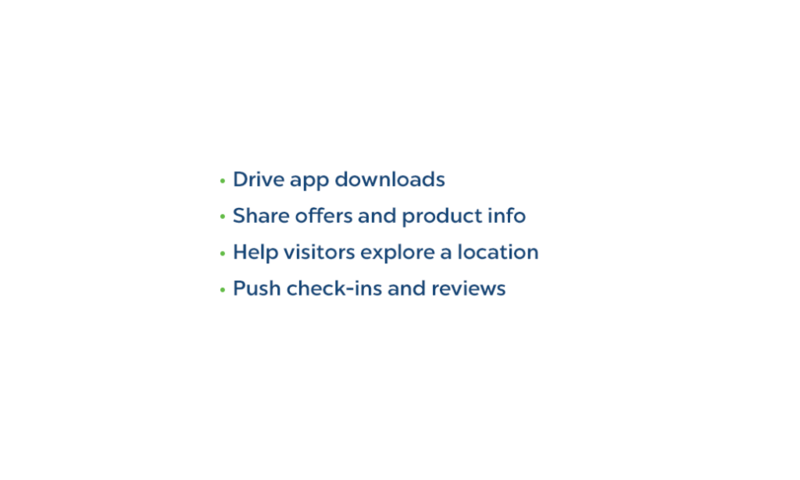 Point users to apps or websites that some users already visit in that location. Be appealing to most users who will receive the notification. Optimizing the beacon location may help target only interested users. Have a direct call to action and avoid surprising the user. How do you push user engagement in your messaging? Be sure to give them content they want and will be happy to interact with. Are you solving a problem? Answering a question? Be sure to know the value of your messages. Nearby vs. Physical Web: aren’t they the same? While Nearby Notifications are built into Google Play Services, and therefore your Android phones, Physical Web is not. It runs through specific apps like Chrome or the Physical Web app itself. As a result, that means while Nearby works only on Android (which uses Google Play), Physical Web can be run on any phone (Android or iOS) that installs the related app. Furthermore, Physical Web will only send notifications when the user enables scanning. Nearby, on the other hand, is designed to run and scan quietly in the background. Tired of reading? This talk from Google I/O walks through the details and technicalities that may fill in the gaps. Or, again, find our complete instructions over here.